A sampling of talks, workshops and projects by Martin Ogle. 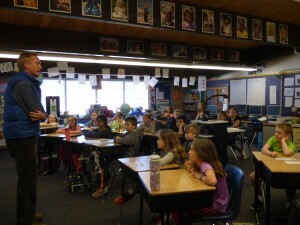 For the past 5 years, I have worked with Lafayette Open Space to develop their Education and Outreach program. This has included a variety of programs, written materials and displays as well as being a public face for Open Space in the field. Lafayette groups and schools can contact me at Martin@EntrepreneurialEarth.com to set up programs. Summer, 2018. 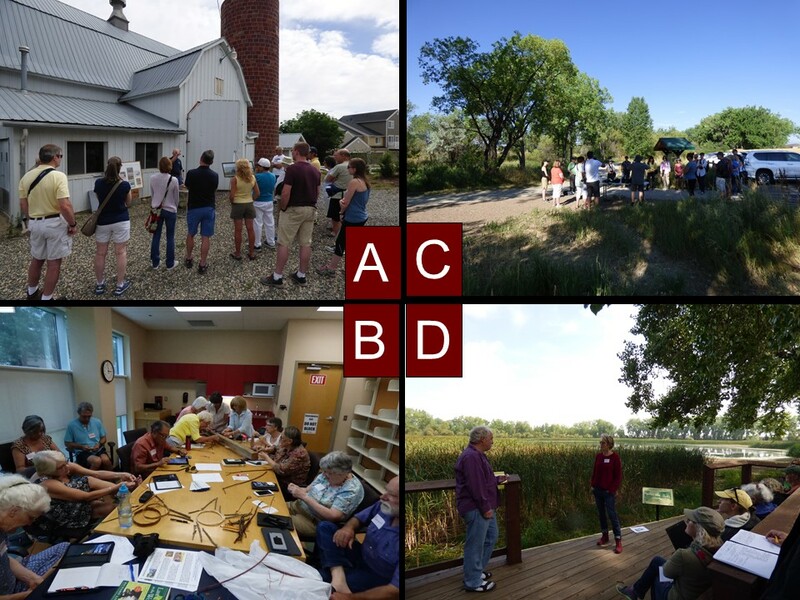 Pictured: A: Tour of Beauprez Barn with Bob Beauprez; B: Grandparents as outdoor mentors (outdoor session at Coal Creek followed); C:Nature photography session with Gerry Morrell; D: Writing workshop with B.K. Loren at Greenlee Wildlife Preserve. Fall, 2018. Pictured: E: History of human land use and how it affected local avian life; F: “Flight at Night” Lantern Walk at Waneka Lake and Greenlee Wildlife Preserve; G: 5th Annual “Celebrating Migratory Birds” festival at Waneka Lake and Greenlee Wildlife Preserve; H: “Open Space: A window into a living planet”. 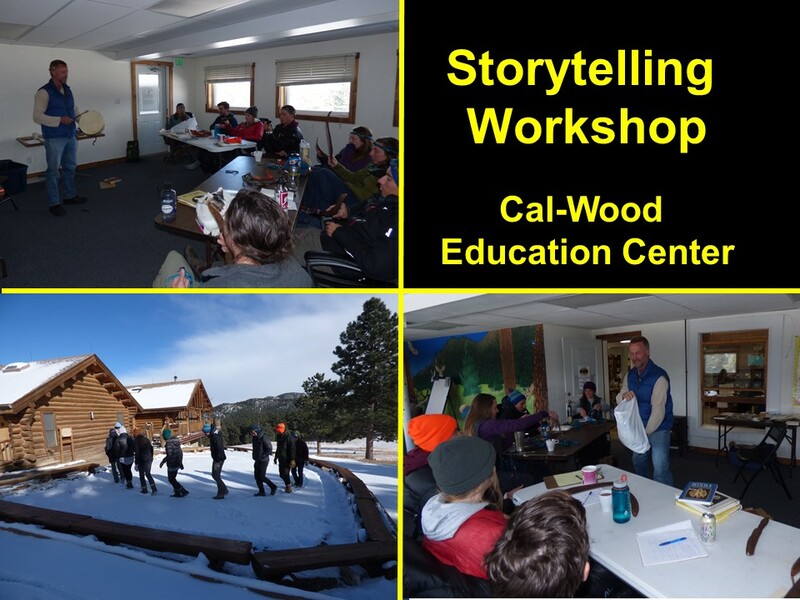 Storytelling workshop at Cal-Wood Environmental Education Center – Nov. 2, 2018. 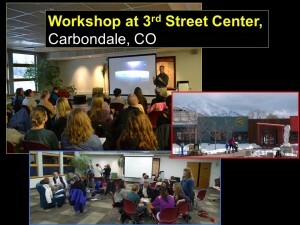 This workshop for the Cal-Wood staff built upon a similar event in February, 2018. We continued to explore storytelling as a link between ancient tradition and the modern world and also discussed a number of strategies and approaches to storytelling to lend it most relevance and power. 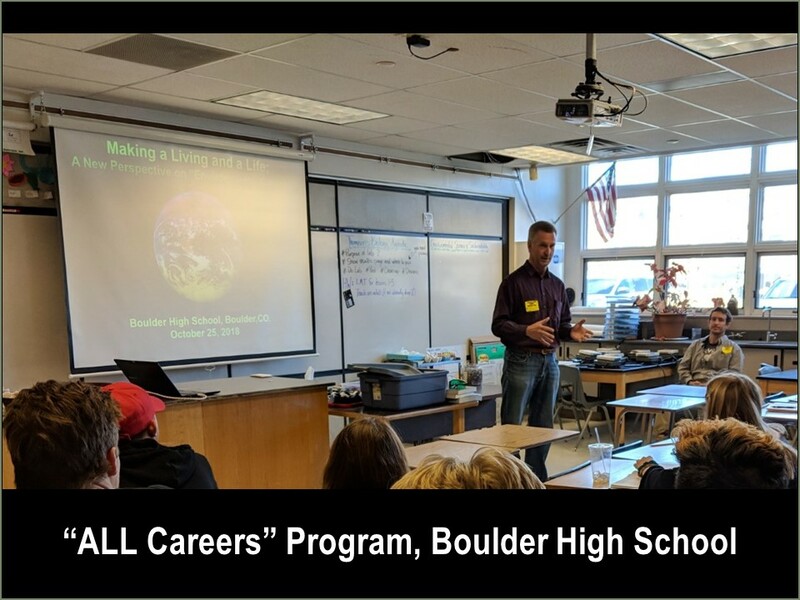 “Making a Living and a Life” A new view of “environmental careers” – a program at Boulder High School, Boulder, Colorado – October 25, 2018. 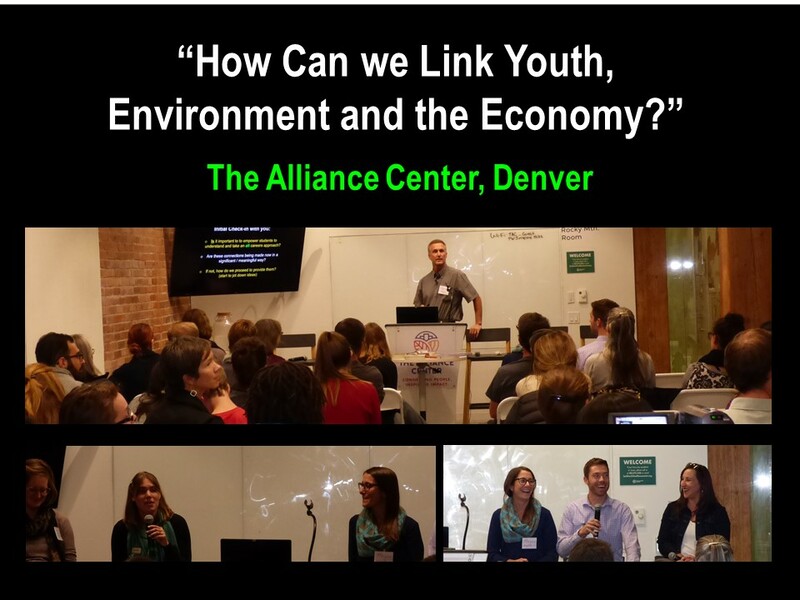 “How Can we Link Youth, Environment and the Economy?” A public event at The Alliance Center, Denver, Colorado – October 23, 2018. 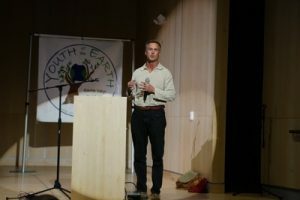 This event advocated for an “ALL Careers approach” of empowering young people to connect environmental principles with All Careers to create a sustainable world. This event was attended by professionals in sustainability, education, business and non-profits and others. The event concluded with discussion of ideas that were added to an initial list of specific steps to advance an “ALL Careers approach” in schools and other venues. 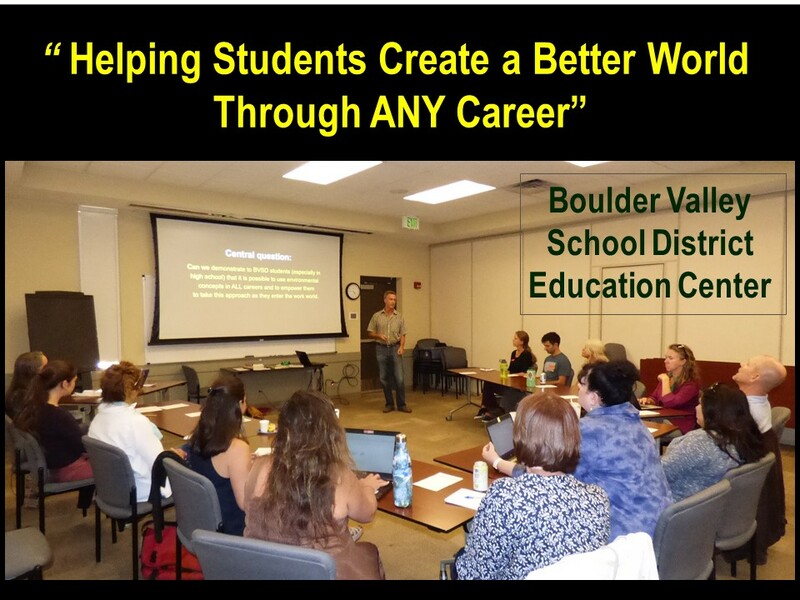 “Helping Students Create a Better World Through ANY Career” – a workshop for teachers, parents and others at the Boulder Valley School District Education Center, October 3, 2018. The purpose of this workshop was to demonstrate that it is possible to forward environmental concepts in all careers and to empower students (especially in high school) to take this approach as they enter the work world. 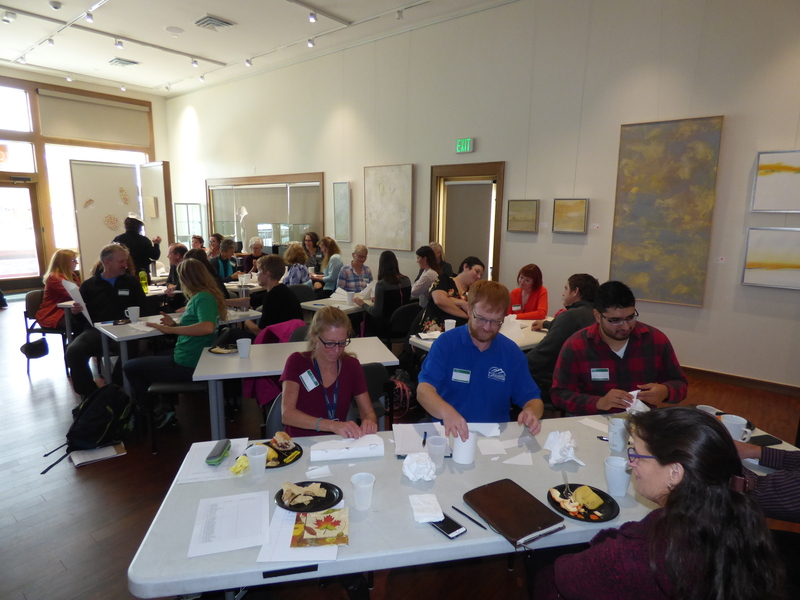 The workshop provided 2 Continuing Education Credits for teachers and included discussion of ideas that were added to an initial list of specific steps to advance an “ALL Careers approach” in schools and other venues. 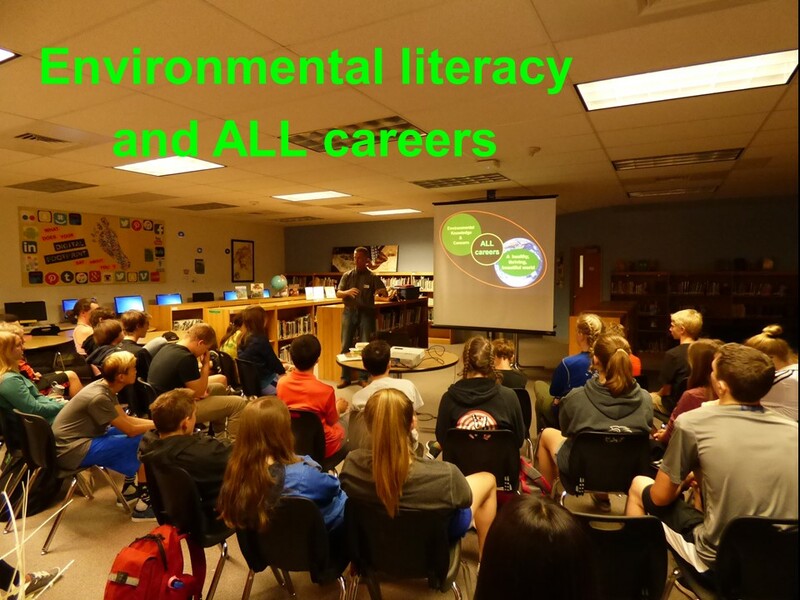 This presentation, like many others I have given to high school (and other) students posited that environmental knowledge and concern can be the basis for just about any career a young person is drawn to and suited for. 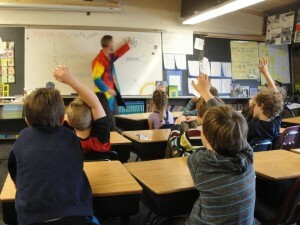 Lafayette groups and schools can contact me at Martin@EntrepreneurialEarth.com to set up programs. Spring, 2018. Pictured: A: Brisk walk at Outdoor Classroom Open Space, starting with stretches led by Rec. Center staff; B: Intro to bird-watching in Lafayette – at JAX Outdoor Gear; C:Ryan Elementary School 5th grade field trip at Coal Creek; D: Storytelling after work project with Wilderness Restoration Volunteers at Coal Creek. 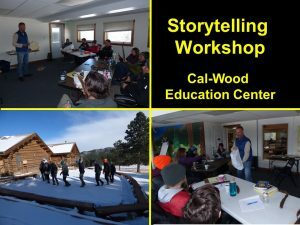 “Telling the Stories We Need” Storytelling Workshop – at Cal-Wood Education Center, Jamestown, Colorado. February 20, 2018. At this workshop, we explored how to make storytelling a link between ancient tradition and the modern world we live in. 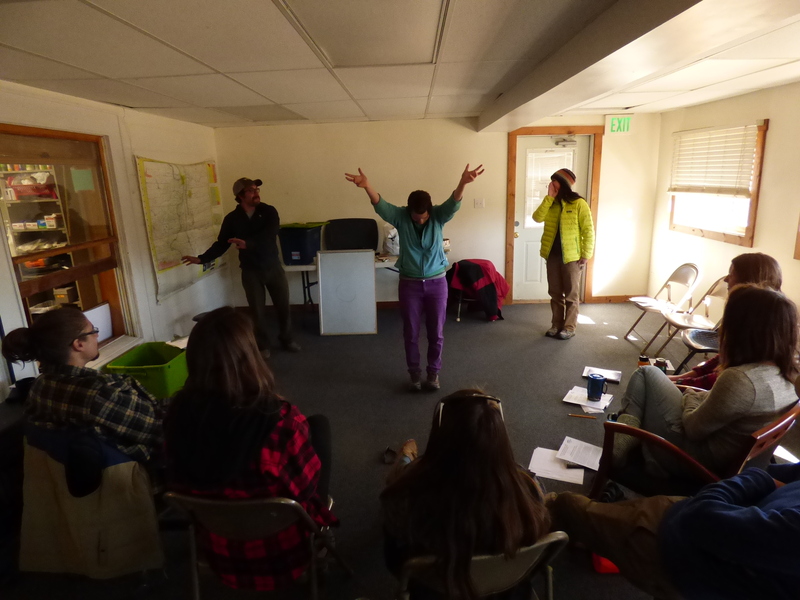 We discussed and demonstrated a variety of hints and tools that enable novices to how to tap into the power and fun of storytelling and give those with more experience new perspectives for continually bringing storytelling to the work of education (and environmental education in particular). “The Science Behind . 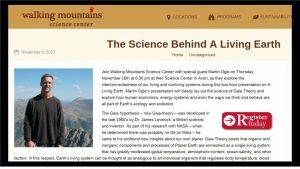 . . A Living Earth” – a program at Walking Mountains Science Center, Avon, Colorado. November 16, 2017. This presentation, part of Walking Mountains Science Center’s community “The Science Behind” series, informed participants about the science and history of Gaia Theory as well as a perspective on how a wider public understanding and application of Gaia Theory could be instrumental to our society’s ability to address and solve modern-day challenges. 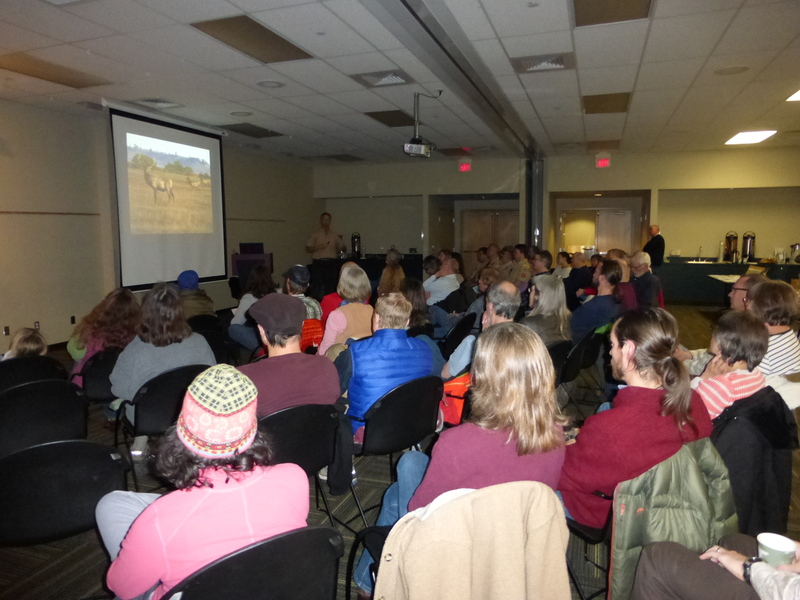 The program began with an introduction by Science Center staff that linked the presentation to local ecology and the two hour format enabled time for much discussion throughout the talk. 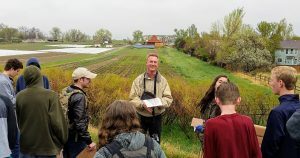 Pictured: A: Lafayette Birds (Monthly bird watching session at Greenlee Wildlife Preserve; B: Program on Colorado mammals for Broomfield Open Space; C: “Making a Living and a Life” – program on connecting environmental literacy with ALL careers; D: Stream ecology program with Peak to Peak Middle School 6th grade. 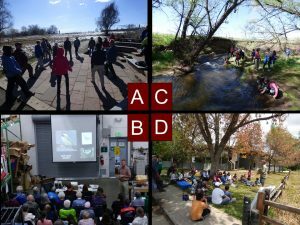 These are among the many programs and resources being offered through Lafayette Open Space. 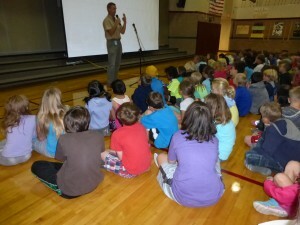 Lafayette groups and schools can contact me at Martin@EntrepreneurialEarth.com to set up programs. “Link Up Lafayette” – a community workshop. September 28, 2017. 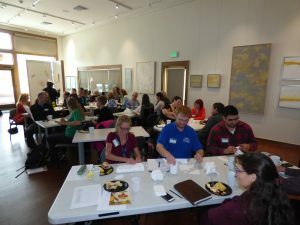 This workshop brought together community leaders from a wide range of work, careers, concerns and issues with the intent of making new connections and having participants consider the value of doing so. The event consisted of a variety of perspectives, information and activities to demonstrate: 1) how the health of human systems, just as any other system in Nature, suffers when there is breakdown in information flow between the parts; 2) the value of connecting diverse human creativity in a community; and 3) the value of connecting both information and emotional energy. “Making a Living and a Life; A new view of ‘environmental careers. 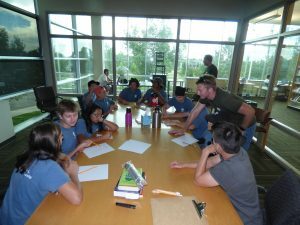 '” – a talk and discussion with Boulder County Youth Corps working in Lafayette, CO. July 20, 2017. “Energy and Life” – a series of talks and field trips for the engineering department at Centaurus High School, Lafayette, CO, May 2-10, 2017. (This is the fourth year that I have done this program). These programs were for six 9th grade engineering classes at Centaurus. 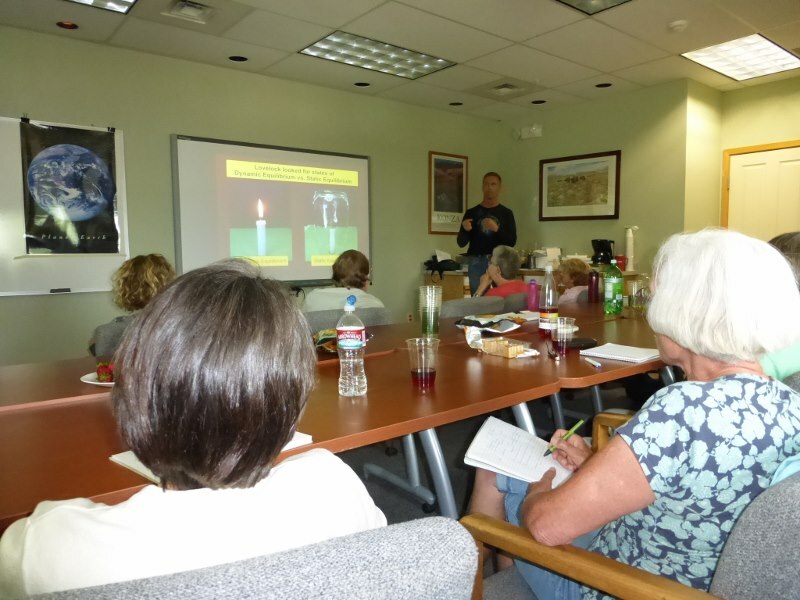 The indoor talk covered basic energy principles, a history of energy use by human beings, and how human energy systems fit in with and interact with Earth’s living systems. 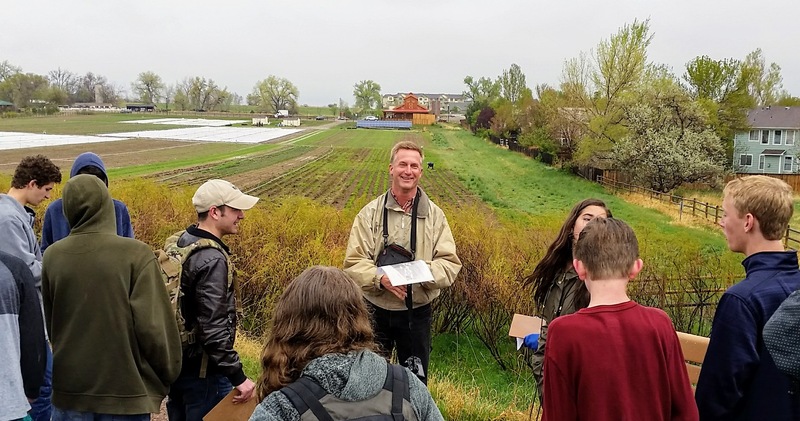 The field trip was a walking tour to Lafayette’s Waneka Lake Park and Thomas Open Space which have been the site of the west’s largest power plant, coal mining and agriculture (which continues at the farm at Thomas Open Space). 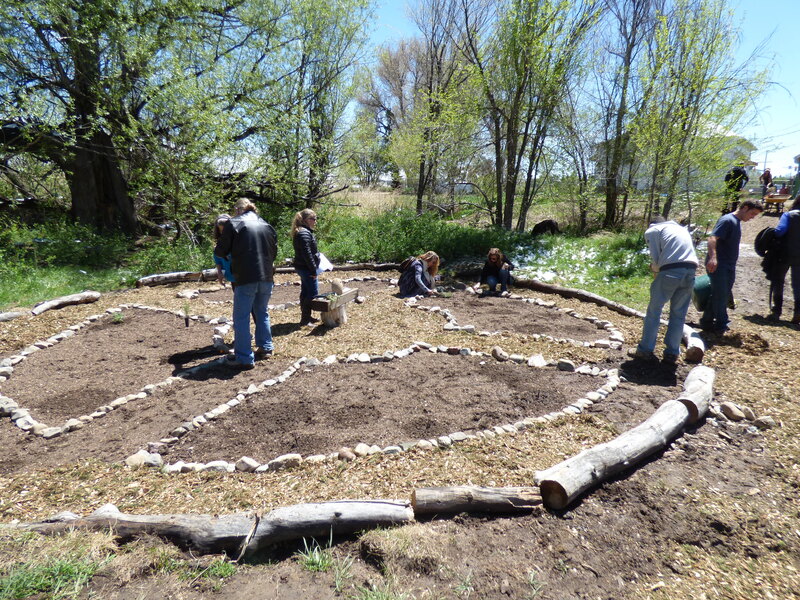 Sacred Circles; Universal Symbolism of Relationship to Earth – a public workshop at Three Leaf Farm, Lafayette, CO, Sun., April 30. 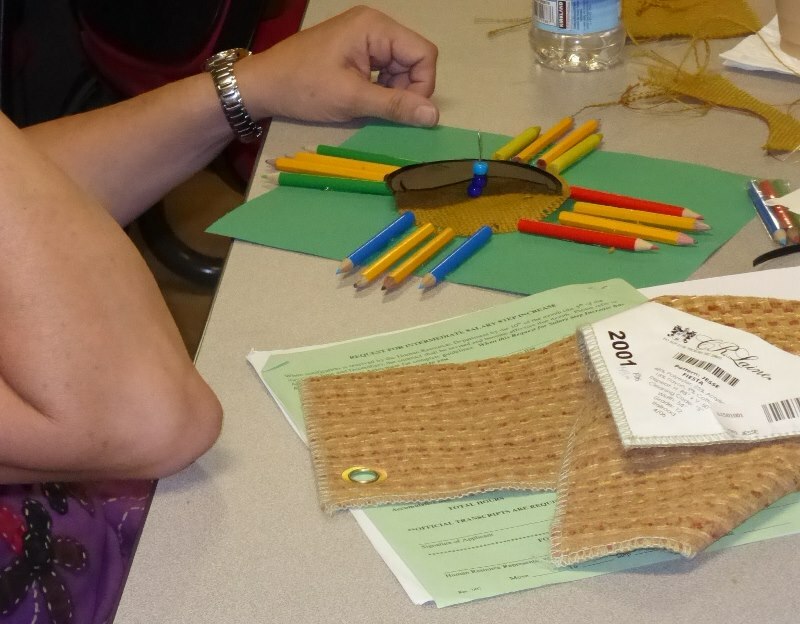 This 3 hour workshop explored how symbols and art help us understand our world and each other. Symbols connected cultures around the world to the places on Earth from which they arose. Understanding ancient motifs – and then creating our own symbols – can help us appreciate modern-day relationships between families, communities and Earth’s living systems. 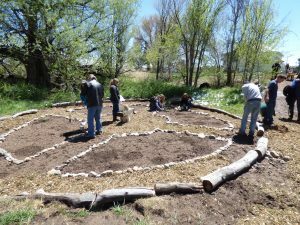 The group then helped mulch and plant a circle garden at the farm and participated in a short ritual to consider the meaning of the four directions. This talk explored how thinking of ourselves as a seamless continuum of Earth could open up new doors to sustainable living. 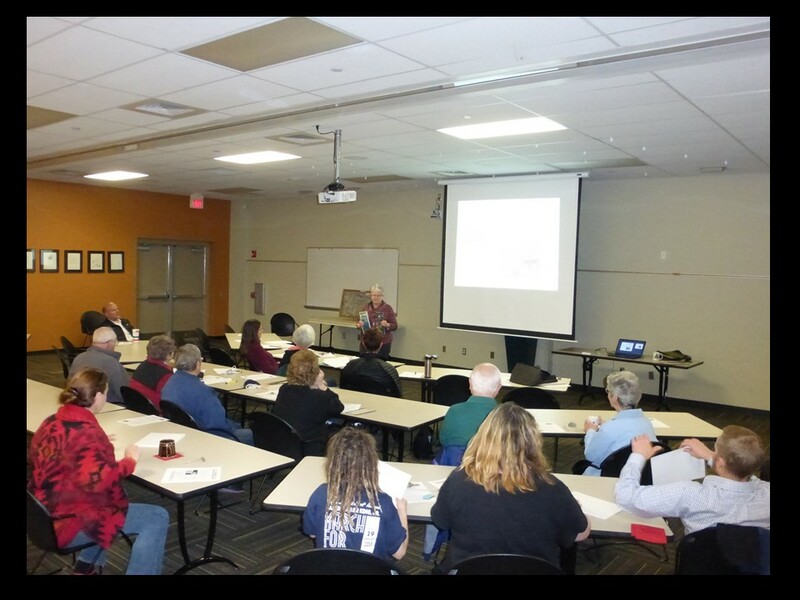 As the talk followed a showing of the film “Green Fire,” which is about Aldo Leopold and the Land Ethic, it included some discussion about how a Geo sapiens view of life is a natural extension of the Land Ethic. 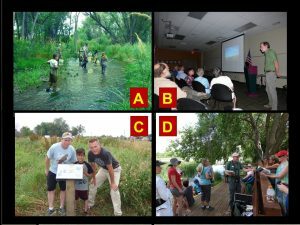 Sustainable Resilient Longmont (www.srlongmont.org) is a local environmental group dedicated to improving the environment in Longmont and beyond. 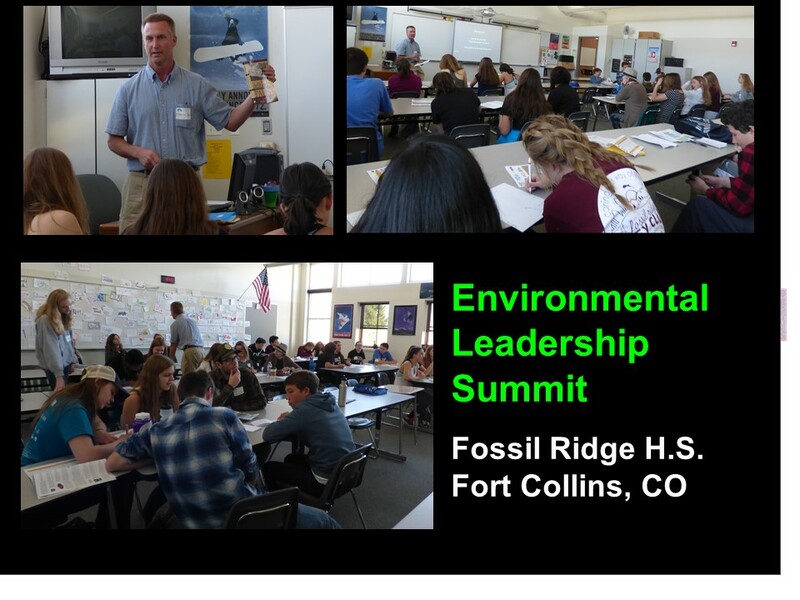 Making a Living and a Life*; A New Perspectives on Careers – talk and wrap-up keynote presentation at The Environmental Leadership Summit, Fossil Ridge High School, Fort Collins, CO, April 7, 2017. 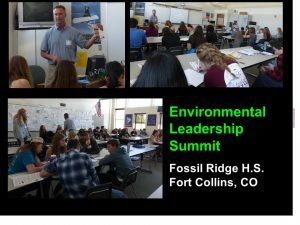 This 2/3 day conference was an amazing experience – it was driven and organized by students in the Fossil Ridge High School sustainability club with guidance from Fossil Ridge counselor, Nick Petersen. Students created an incredibly well-organized event with a wide range of speakers and attracted over 300 students from local high schools. The positive, can-do attitude displayed by all involved was both heartwarming and awe-inspiring! 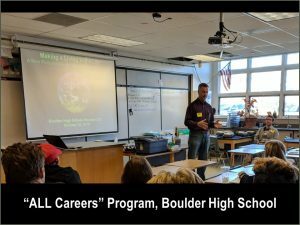 My role in this event was to talk about the connection between environmental literacy (understanding of how human systems fit in with Earth’s living systems) and ALL careers. I suggested that if this connection was made an ongoing and integral part of young people’s lives that students would create a new economy through their careers, avocations and other work. In the wrap up keynote talk, I further suggested that if this kind of event “went viral,” it could enable high school school students to be one of the most significant forces in the quest for a sustainable world. 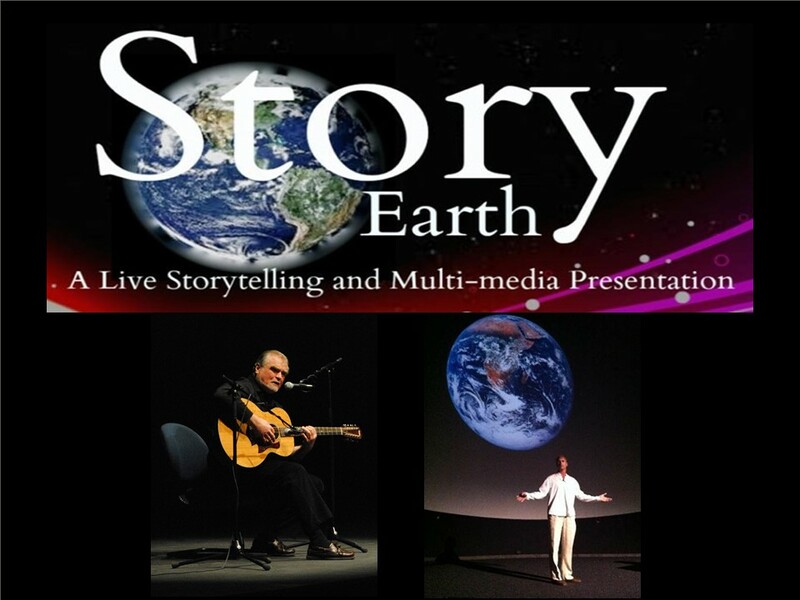 “StoryEarth” – A thought-provoking stage performance at Univ. of Colorado’s Sustainability, Energy and Environment Complex, November 9, 2016. This performance combined epic storytelling and scientific discourse to ask some big questions. Can a symbiosis of story and science help guide us toward thriving, long-term human life on Planet Earth? I teamed up with Master storyteller, Odds Bodkin, who told a lighthearted folklore tale and then a raw, powerful rendition of the ancient myth of Gaia. I asked the audience to juxtapose the adult interpretation of Greek myth with the newest scientific understandings of humans and Earth to conceive a new, emerging story. 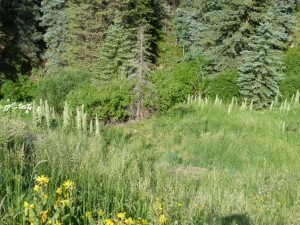 These are among the many programs and resources being offered through Lafayette Open Space. 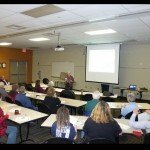 See http://www.cityoflafayette.com/160/Open-Space (Calendar on right of webpage) for upcoming programs. This workshop – a morning within a full-day staff retreat for Walking Mountains Science Center – included talks, outdoor activities and facilitated discussion. 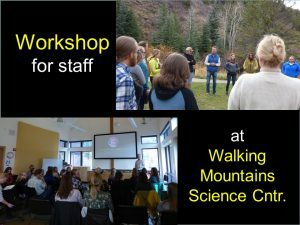 It employed the “Gaia Paradigm” to enable Walking Mountain staff to “Reconnect to our mission and each other.” Topics considered included energy education, sustainability and entrepreneurship and staff collaboration. 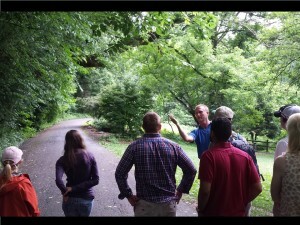 Testimonial: Martin facilitated an engaging experience for our staff retreat. His expertise on Gaia Theory combined with his passion for environmental and sustainability education truly energized us. 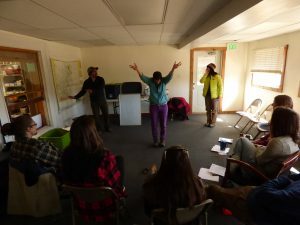 Not only did we gain a greater understanding of how our day-to-day place-based work integrates with Gaia Theory, we made deeper connections with one another and developed creative new ideas for our educational program. – Kim Langmaid, Founder, Vice President, and Director of Sustainability and Stewardship Programs, Walking Mountains Science Center. 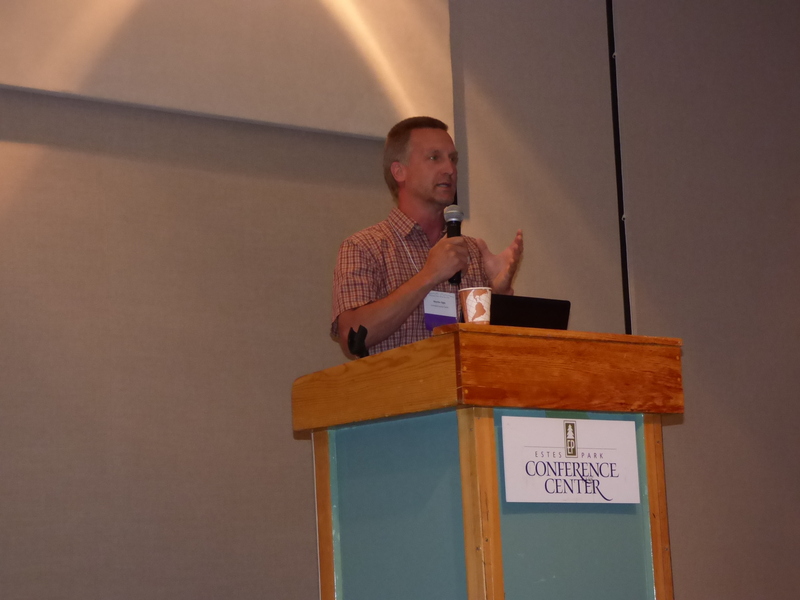 · Martin Ogle was a great presenter. Interesting and dynamic. I thought that he shared a lot of interesting information with us and very intentionally connected Gaia to our mission and work. · Martin did an awesome job relating to a wide audience. · Mental stimulation! I liked that this retreat helped us connect to our mission, vision, and values through a more academic approach. · I enjoyed learning about Gaia Paradigm because it relates extremely well to our mission. I also enjoyed the conversations about how we can apply it to our work and our relationships with co-workers. · Most valuable was connecting our day to day work to Gaia Theory and seeing the relevance of our place-based approach from a global perspective. 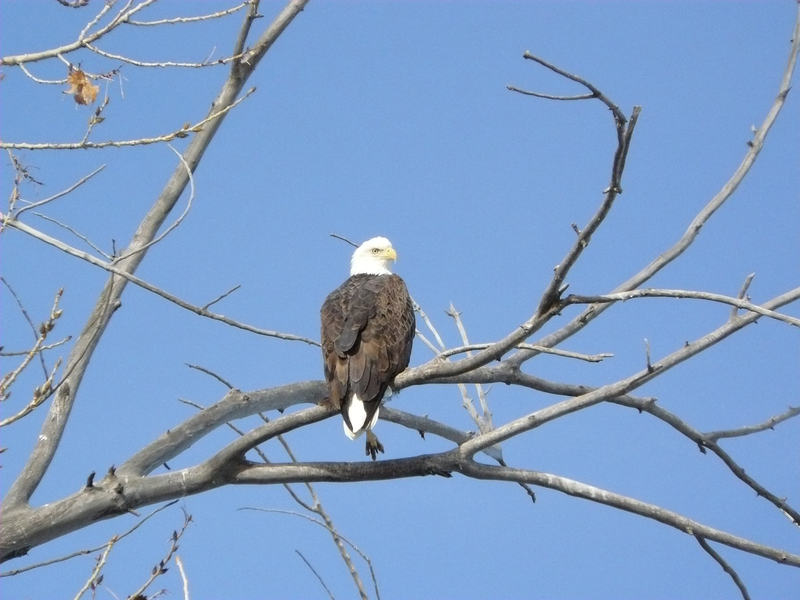 · I thought it was an energizing day! I especially liked the post-presentation discussion among colleagues prior to lunch. Some very interesting and good ideas for applying the Gaia Theory to our organization came out of this conversation. 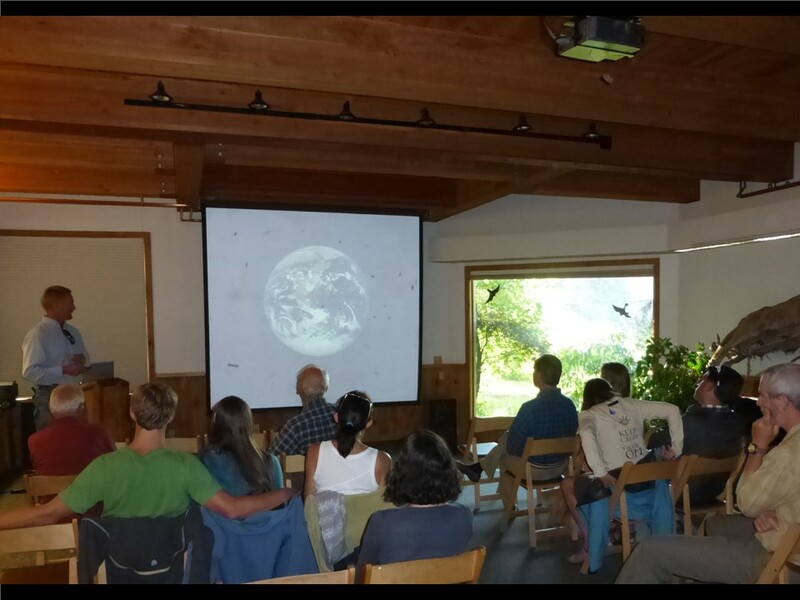 · Martin did a great job of making Gaia Theory applicable to everyday environmental stewardship. 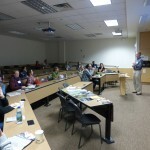 · His presentation brought all of our departments together to discuss the foundation of why we are involved in the field of environmental education, whether we are teachers, coordinators, or directors. It was an inspiring spark for us to reignite our passion behind our mission. · I think Martin did a great job presenting a very interesting theory and helping make it relevant to our work and mission. I appreciate that he seemed to be familiar with our work. 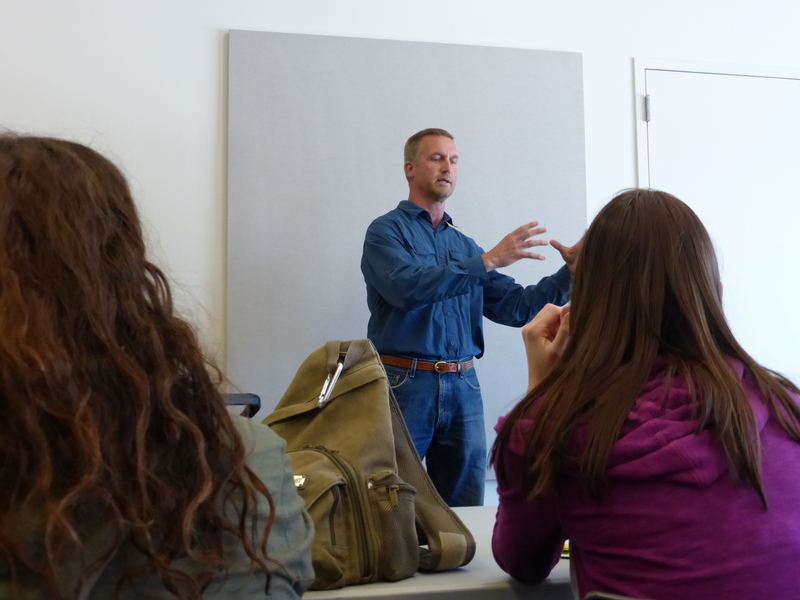 · Martin was a great speaker who kept us all very engaged. I would love to have him talk here again whether for staff or for the public. 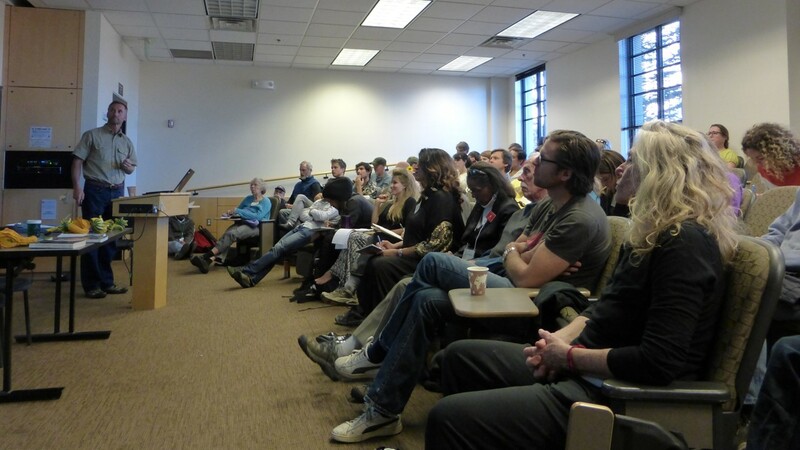 · I thought his presentation was thorough and very interesting. 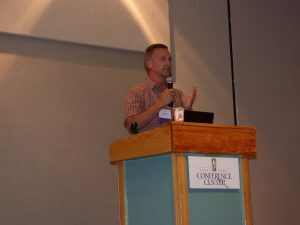 I enjoyed how he challenged our organization to be more influential and push boundaries within sustainability education. 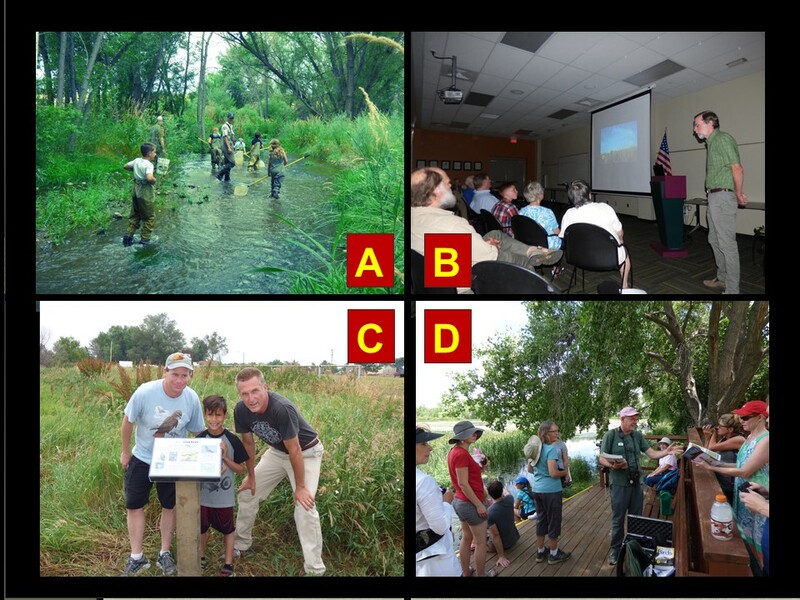 Pictured: A: Fish sampling in Coal Creek with Colorado Parks and Wildlife; B: Lecture on prairies at Lafayette Library by Steve Jones; C: Placement of display on Red-tailed Hawk produced by Pioneer Elementary School student; D: “Lafayette Birds” birdwatching session at Greenlee Wildlife Preserve with bird expert, Ted Floyd. 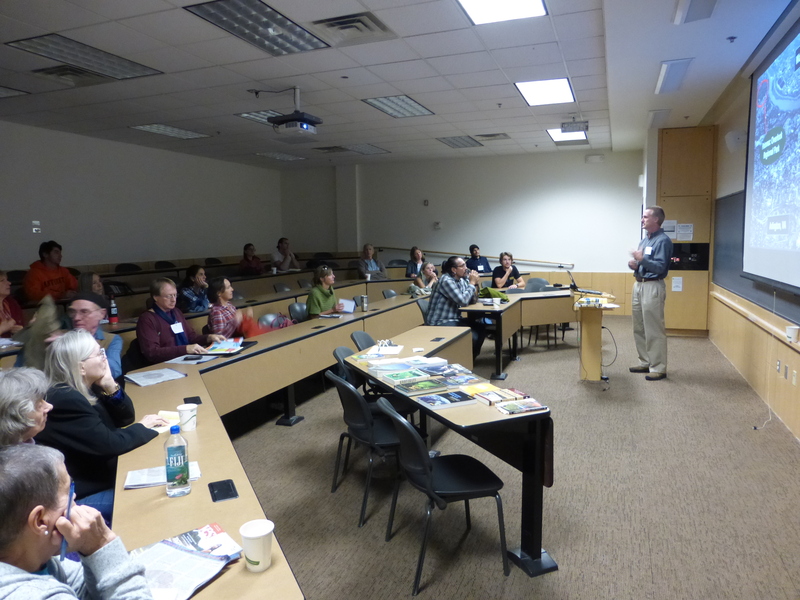 This talk, entitled “Inspiring Lands Inspiring People” explored inspiration in a number of ways to provide open space professionals new perspectives for land management, education and promotion of the lands we administer. 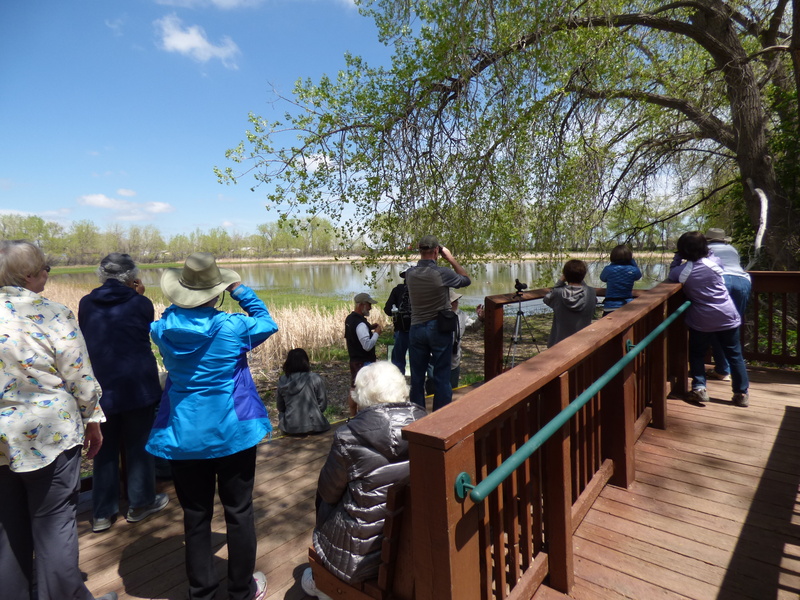 “Lafayette Birds,” a series of birdwatching opportunities at Greenlee Wildlife Preserve especially for beginning birders (adults and families). This is one of the many programs that are now being offered through Lafayette Open Space. 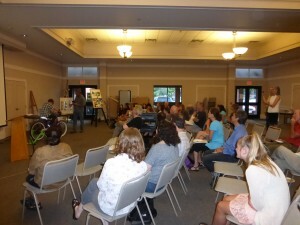 See http://www.cityoflafayette.com/160/Open-Space (Calendar on right) for upcoming programs. Geo sapiens: Re-linking our community through connection to place – A 4 hour workshop at Sister Carmen Community Center in Lafayette, Colorado, Sat. April 30, 2016. This workshop brought people from many walks of life (youth, business, environment/ sustainability, art, non-profits and many more) in Lafayette and the rest of Boulder County. The workshop was based on the premise that all elements of our human communities are seamlessly connected to each other and to the places we live. The workshop metaphor “Geo sapiens” provides a framework in which participants sensed and drew upon the powerful interrelationships between people and the living systems of the places we live. Special emphasis was placed on finding local links between youth, business and sustainability, and a number of conversations have emerged around this theme since the workshop. 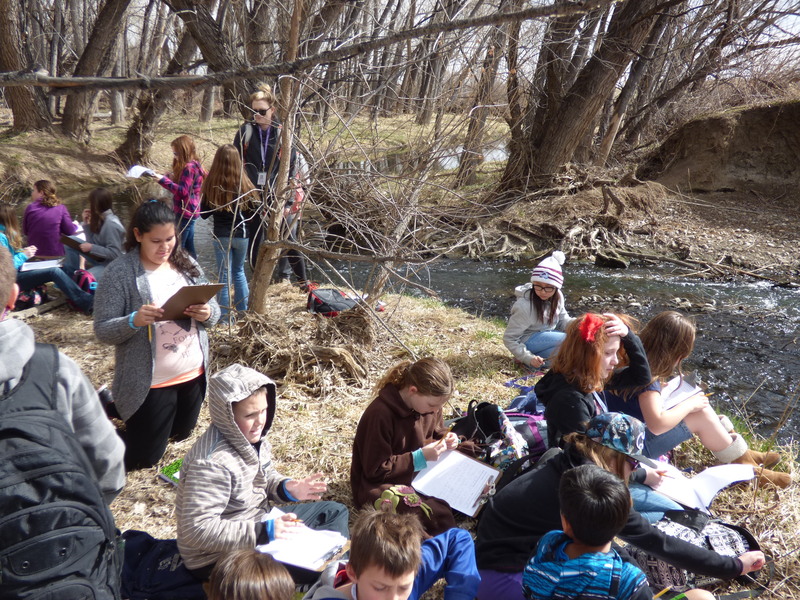 Continuing work with Lafayette Open Space – Field trip at Coal Creek with 5th Graders at Ryan Elementary School on March 4, 2016. 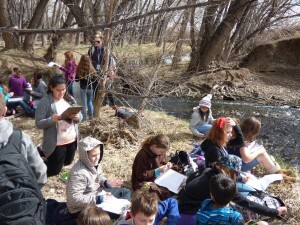 This field trip explored the landforms and life of Colorado . . . and the interrelationships between the two! How does plate tectonics create landforms? How does life affect plate tectonics? Much more!. Why Gaia Matters: The application of science and metaphor to local and global sustainability – a 2.5 hour workshop at the 3rd Street Center in Carbondale, CO, February 18, 2016. This workshop introduced the Gaia Paradigm and discussed/explored its application to the arts, entrepreneurship and governance. 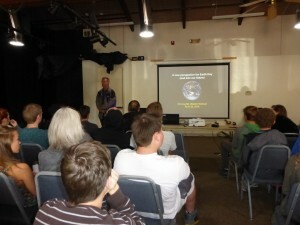 This program was presented to students at Colorado Mt. 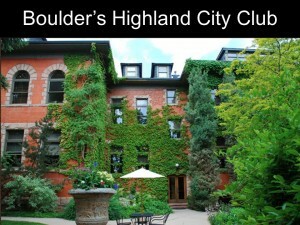 College (sustainable business course) as well as the general public. TESTIMONIAL: It’s not every day that one meets a truly inspired, sincere and dedicated practitioner of Earth stewardship. I recently attended a workshop of Martin Ogle’s and was moved greatly by his passion, deep sincerity and commitment to preserving our Earth’s fragile ecology within the context of the human desire to develop our already limited natural resources. Gaia in Mind; A fresh look at Earth and Sustainability – 2 talks at Frasier Meadows Retirement Community, one in January, 2016 and one in February, 2016. “The Rock Spoke;” Stories that connect us to Life, Science, and Life Sciences – Storytelling programs at Louisville Elementary School, February 25 and 26. These programs use stories as the basis for understanding our human relationship to nature, connecting the insights and understandings of our ancestors to modern, scientific discoveries. 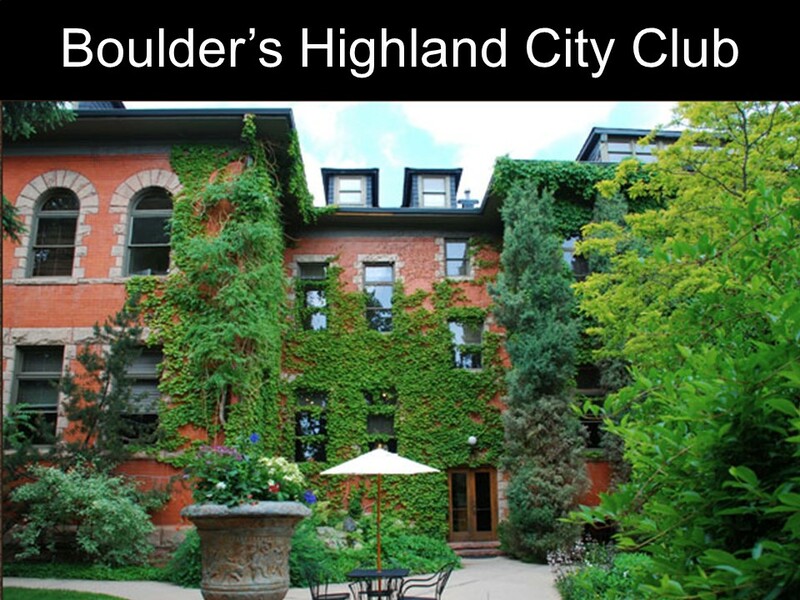 Gaia in Mind; Human consciousness and the ecology of Planet Earth – a presentation at Boulder’s City Club, November 12, 2015. 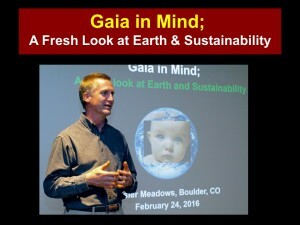 Gaia Paradigm; The Confluence of Earth Science & Earth Story – Presentation at the Boulder Bioneers conference, October 24, 2015. This presentation posited that the Gaia Paradigm – or something like it – might be necessary for our society to move in sustainable directions. That is, there must be a confluence of our newest scientific understandings of Earth as a living system with the stories that move and motivate us. 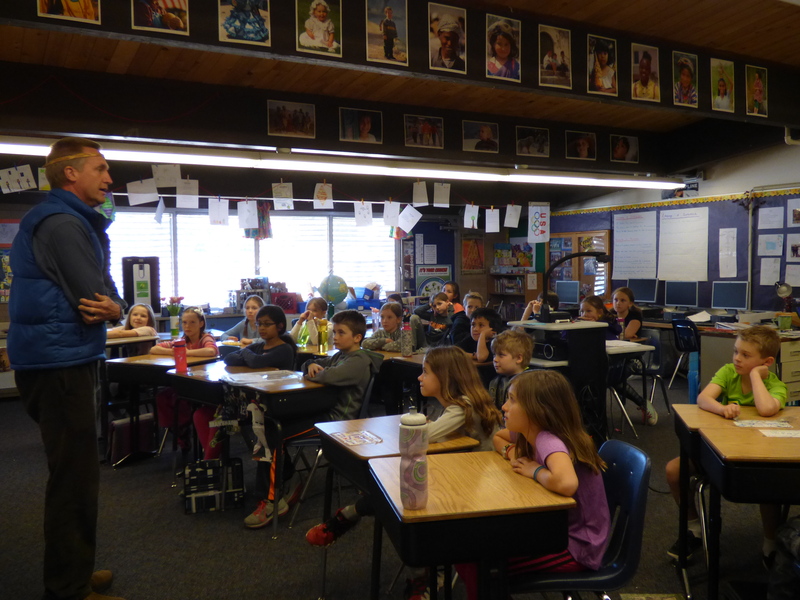 Energy Program at Louisville Elementary School – October 20, 2015. 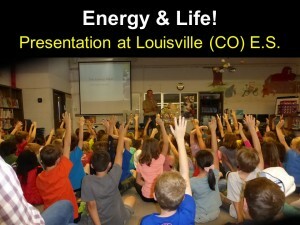 This was the 4th year that I presented “Energy and Life” for Louisville E.S. 4th graders. What fun – especially with the amazing energy education tool, the “energy bike!” This presentation explores the basics (and learning standards) of energy, but in the context of how energy moves through living systems of Earth, including human systems. 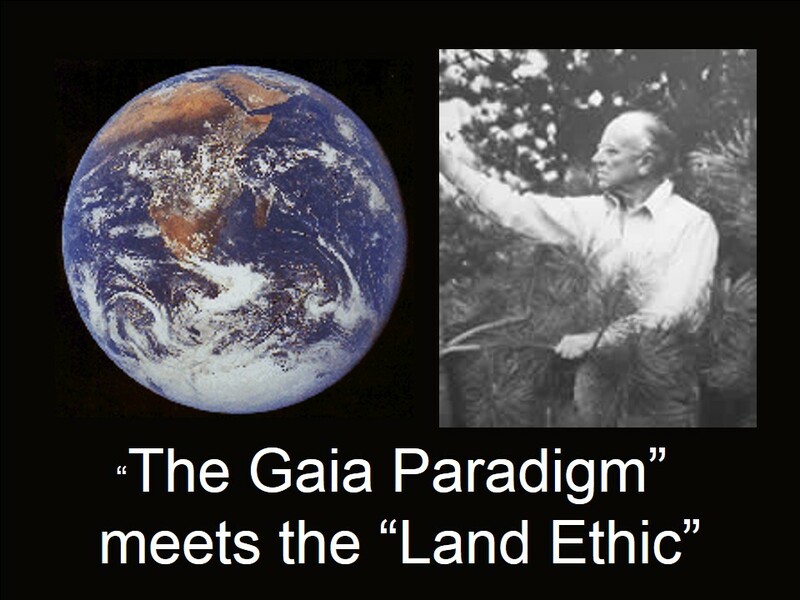 The Land Ethic & Gaia Paradigm; The co-evolution of two great ideas – at S.U.N.Y. Cortland, October 8, 2015. 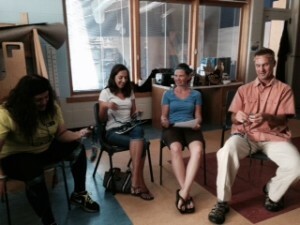 Storytelling workshop with Lafayette Rec Center Staff – August 15, 2015. 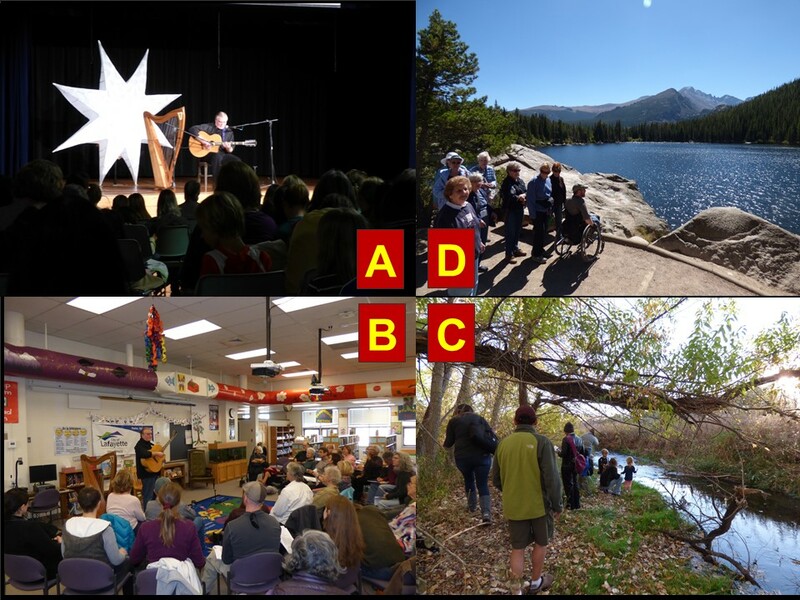 Storytelling has been a big part of my work over the years – telling stories as part of programs and camps; hosting storytellers such as Odds Bodkin; and, recently, helping organizations harness the power of storytelling themselves. At this workshop, we explored the power of storytelling, hints for and elements of storytelling, made a storytelling headband (pictured) and more. Work with Lafayette Open Space. Since early 2014, I have been working with Lafayette Open Space helping them develop their new education and outreach program. 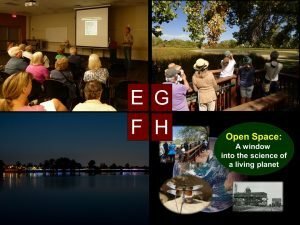 This has included: 1) presenting and arranging a variety of programs, some indoors at Lafayette Library and many outdoors at various Open Space properties; 2) developing display panels that have been placed in the Outdoor Classroom Open Space and, soon, along Coal Creek; 3) developing a self-guiding pamphlet for use at Waneka Lake and nearby Open Space properties; and more. 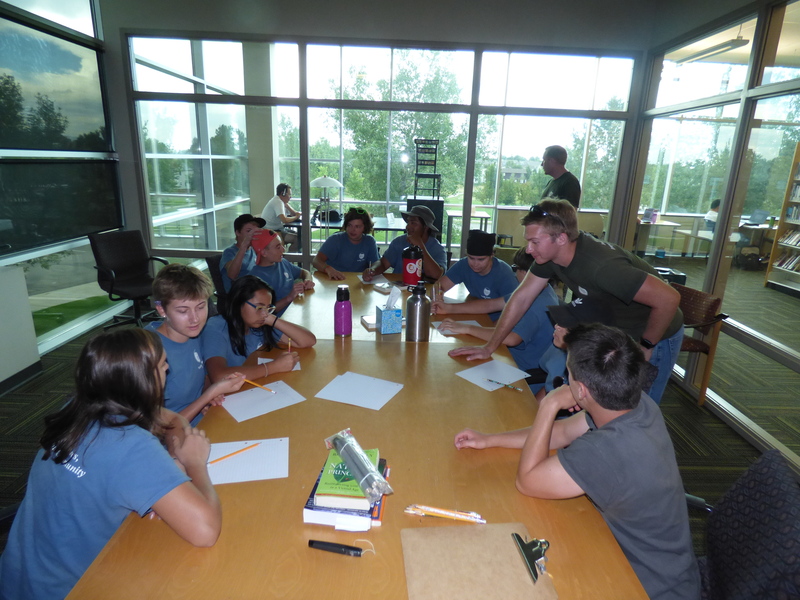 Aspen Center for Environmental Studies – Summer, 2015. 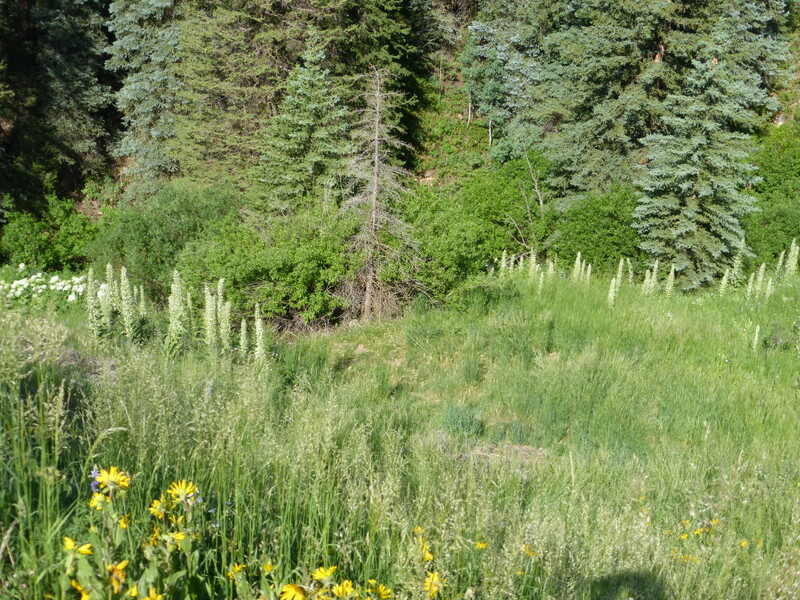 For the past 4 summers, I have helped ACES control non-native plants, construct trails and otherwise maintain and improve a 160 acre property called “Spring Creek.” This property was formerly a fish hatchery and was donated to ACES to be used for environmental education. Opening talk for all-day Earth Day activities at Shining Mountain Waldorf School in Boulder Colorado – April 22, 2015. This talk introduced Gaia Theory to students and faculty and suggested that our biggest challenges for advancing sustainability include making our underlying cultural narratives compatible with emerging, scientific understandings of Earth as a living system AND the creation of a new economy. These themes were further explored with breakout and whole-group discussion sessions after which students spent their day outside. 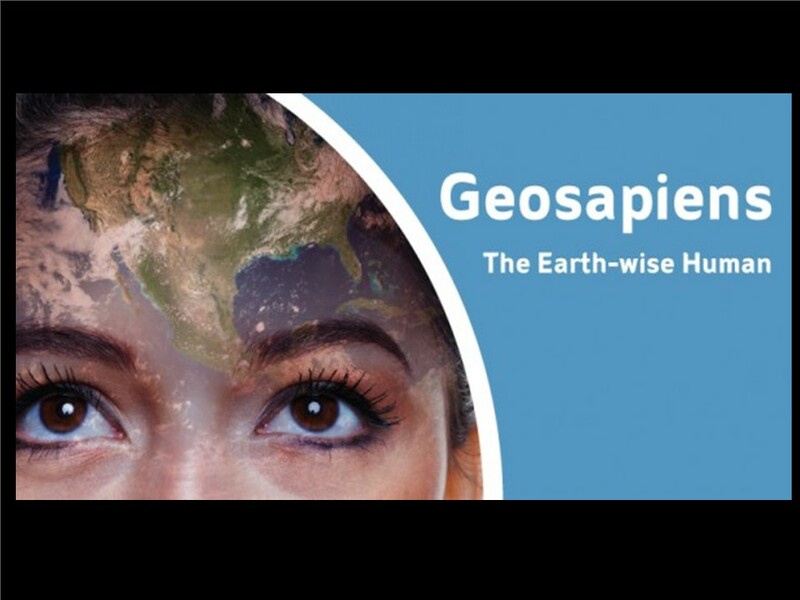 This talk, entitled “Geo sapiens; The Earth-Wise Environmental Educator,” challenged educators to incorporate interdisciplinary context and perspectives that reveal human society as a seamless continuum of a living Earth. 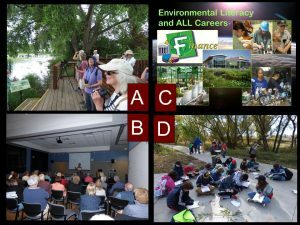 Special emphasis was placed on encouraging EE practitioners to apply our environmental knowledge to the challenge of creating jobs and careers that fundamentally change our human relationship to Earth’s living systems. 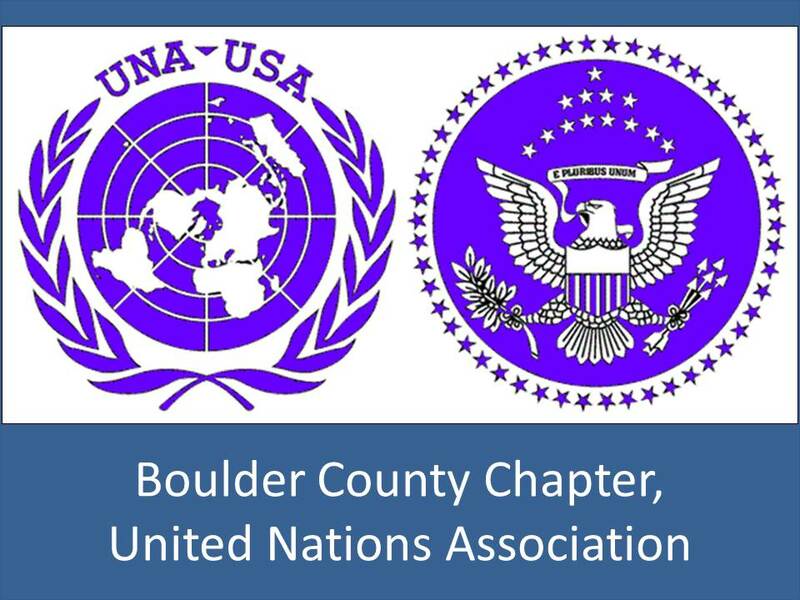 Talk with the Boulder County Chapter of the United Nations Association – February 19, 2015. I made a short presentation and then had discussion with members about the need to actively engage with indigenous cultures from around the world to bring their perspectives, beliefs and ways of living into the conversation on sustainability. This is an important part of the evolution of a new cultural narrative for our own society. “Noticing Lafayette” – February 19, 2015. A public program for Lafayette Open Space, this program featured a new project called the “Lafayette Observation Journal.” The journal is a collection of one-page journal entries about local human and natural history, events and occurrences of note, etc., and is on permanent display at Lafayette Public Library. 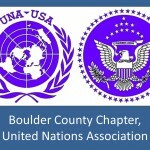 “The Gaia Paradigm and its implications for sustainability in Boulder County” – February 18, 2015. 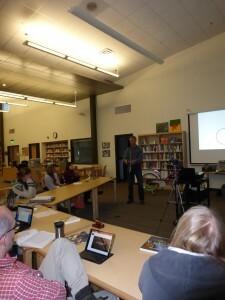 A presentation and discussion with local professionals in education, open space, climate studies, etc. about the Gaia Paradigm. 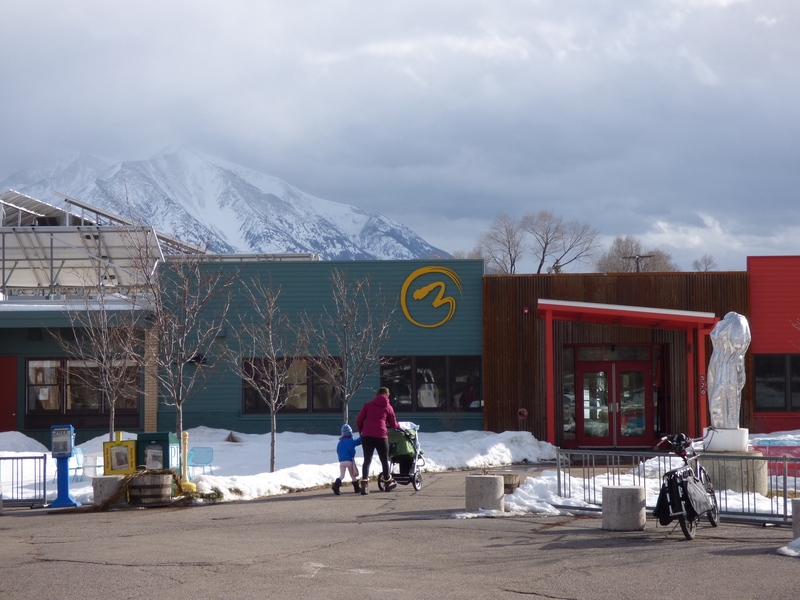 Program was held at the Shining Mountain Waldorf School in North Boulder. 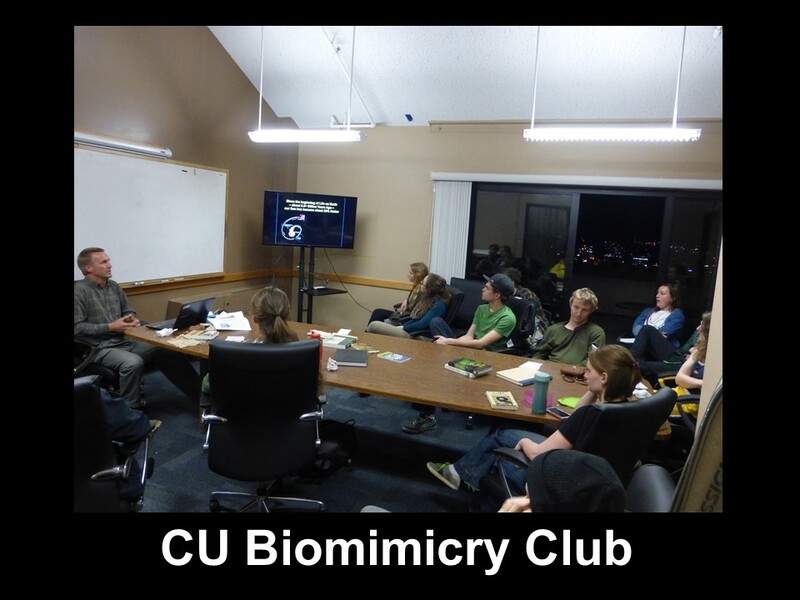 “The Gaia Paradigm and Biomimicry” – February 12, 2015. 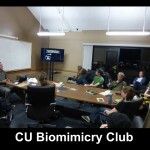 A presentation and discussion with the CU Biomimicry Club (http://boulderbiomimicry.com/). 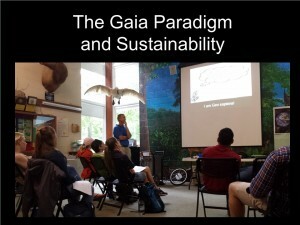 Purpose was to introduce the “Gaia Paradigm” and its relevance to the 2015 Biomimicry Challenge (http://challenge.biomimicry.org/). 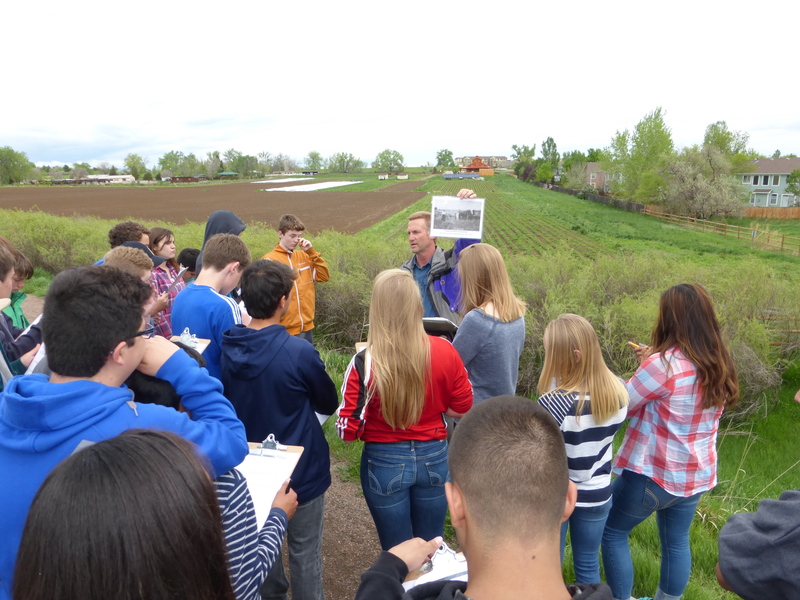 This workshop explored how viewing human history and activities as part of Earth systems provides a valuable context for developing interdisciplinary education. Math, science, literature, art and other subjects were discussed and linked through the centering concept of the Gaia Paradigm. 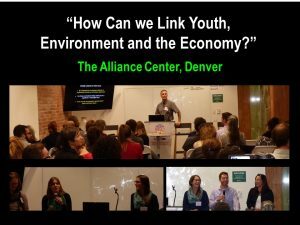 This presentation explored new perspectives on activism and entrepreneurship based on understanding human systems as a seamless continuum of Earth’s living system. 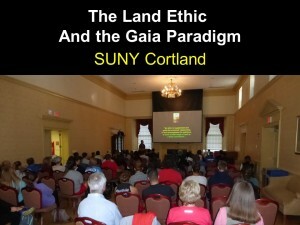 October 11, 2014 – The Land Ethic and the Gaia Concept; a Powerful Synergy for our Living Earth! 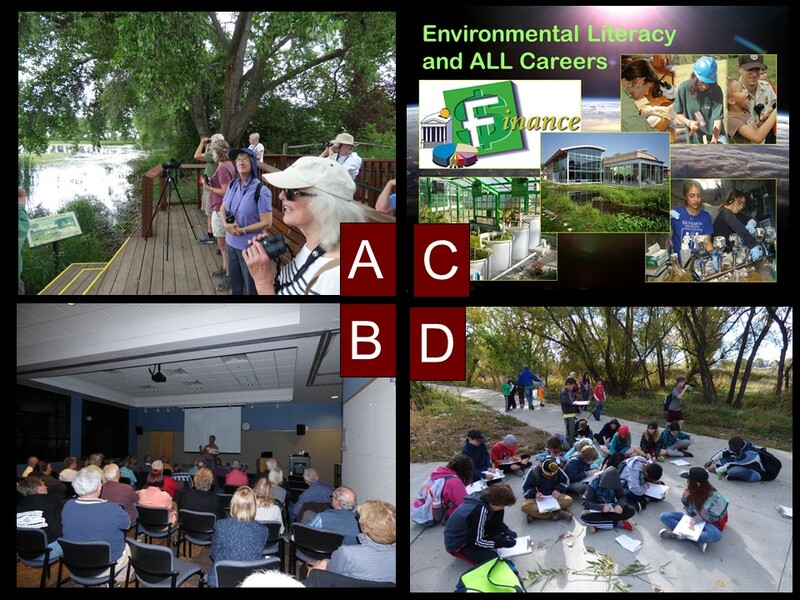 Retzer Nature Center, Waukesha, Wisconsin – An all-day workshop for environmental educators and others that explored the synergies between Aldo Leopold’s Land Ethic and the “Gaia Paradigm.” These ideas have some common roots and have the potential to contribute to a new “Cultural Narrative” that compels a symbiosis between human systems and the rest of Earth’s living system. This public presentation expl ored the intersection of recent insights into Earth as a living system with cultural narratives, ancient and new, of human beings as a seamless continuum of Earth. 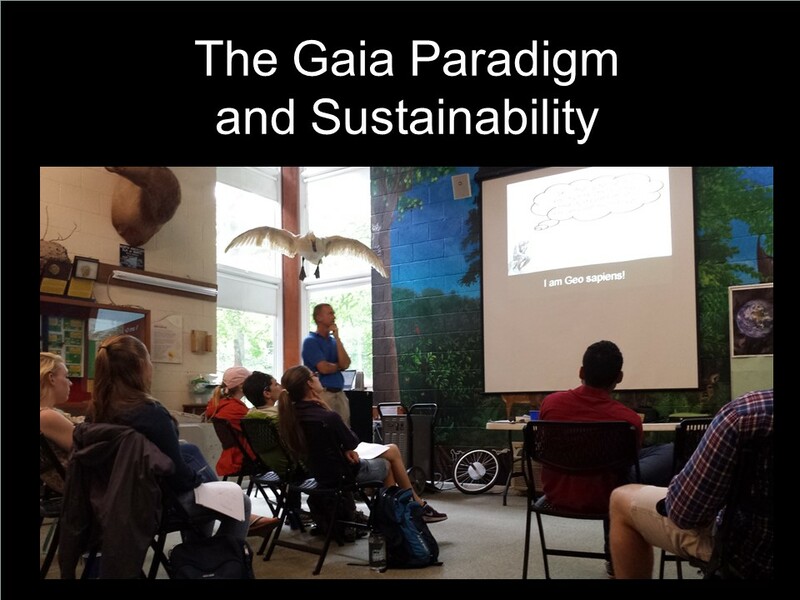 June, 2014 – “The Gaia Paradigm and Sustainability” – An all-day workshop for George Mason University graduate students. Held at Potomac Overlook Regional Park in Arlington, VA for a summer graduate course on sustainability. This workshop involved lectures and indoor and outdoor activities. 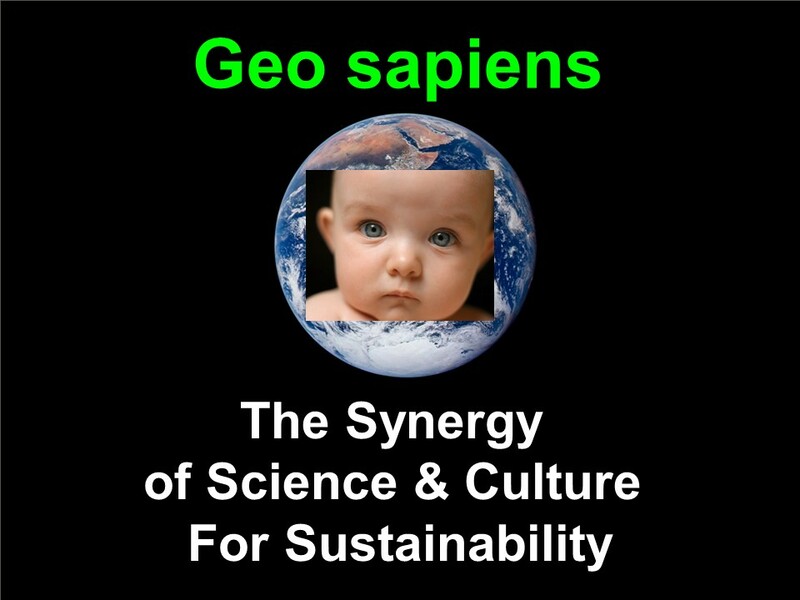 I presented a talk entitled “Geo sapiens; The Synergy of Science and Culture for Sustainability” to a group of engineers, economists and others from the United States and Europe. 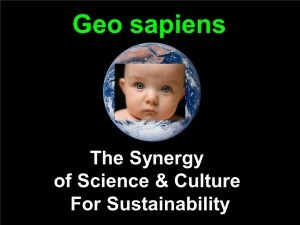 The term “Geo sapiens” (and another term, “cultural narrative,” were much discussed and cited during the conference. 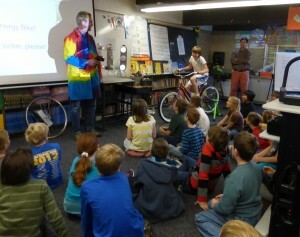 Spring, 2014 – Energy Education with Clean Energy Action (CEA) – Using the “CEA Energy Bike” – I conduct programs for 4th – 12th graders to help raise the energy literacy of our society. In a time when energy is, perhaps, the most cross-cutting issue we have to grapple with, it is imperative that our society make wise energy decisions based on an interdisciplinary understanding of how energy fits in with Earth’s living system! 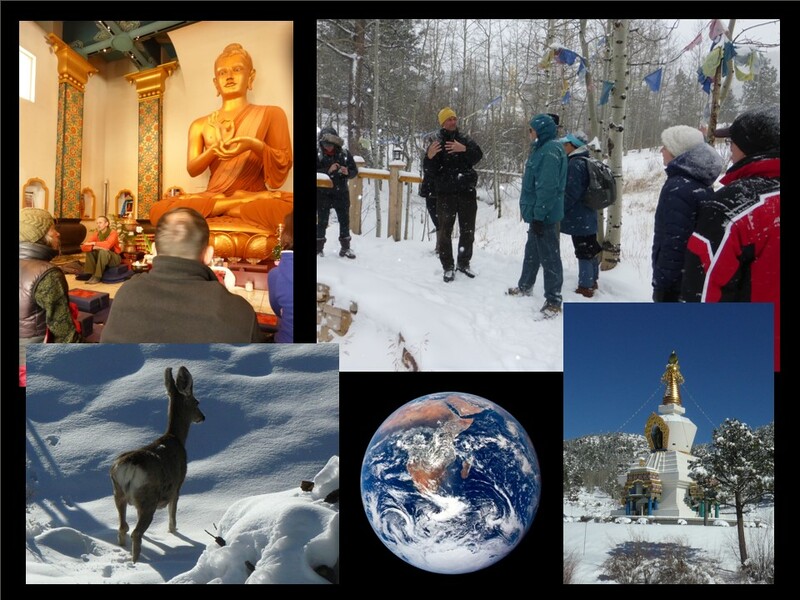 This retreat explored new understandings of Earth and our relationship to Earth and the implications for managing the frantic pace and disconnections that modern culture imposes upon us. The weekend included walks, talks and discussions and a visit to the Great Stupa at Shambhala Mountain Center. We discussed the parallels and synergies between Buddhist symbols and other symbols from around the world that describe our human relationship to life as a circle and four directions. 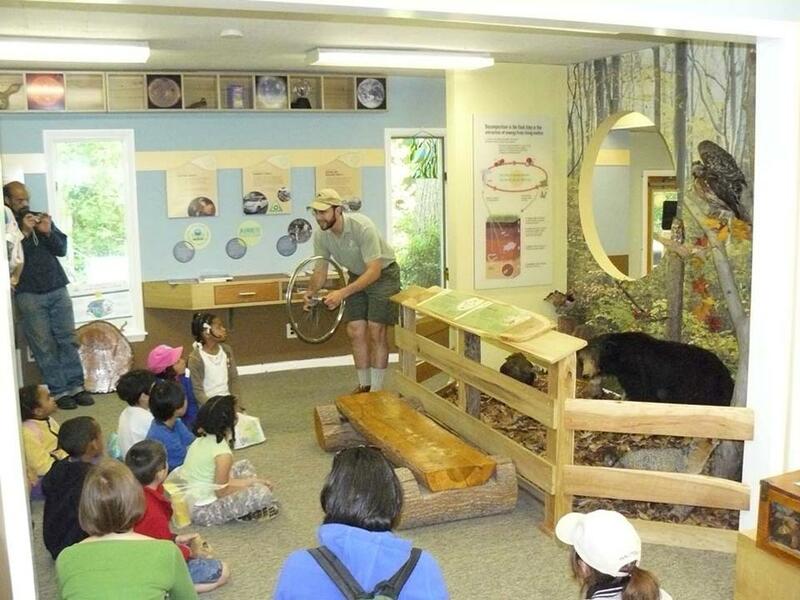 Work includes establishment of program series, educational displays, acquisition of educational materials and more. “Earth Learning” followed by “Energy and Life” – two presentations that placed energy lessons in the context of Earth as a living system – Louisville Elementary School, 4th Grade – October, 2013 and November, 2013. The first presentation was an assembly for all four classes of 4th graders and included imagery on the big-screen with narrative and music, as well as a Native American story of how we are part of a living planet. The second presentation was an interactive exploration of energy concepts presented to smaller groups. It centered on how human systems and other natural systems are on the same energy path powered by the conversion of the sun’s energy through photosynthesis. 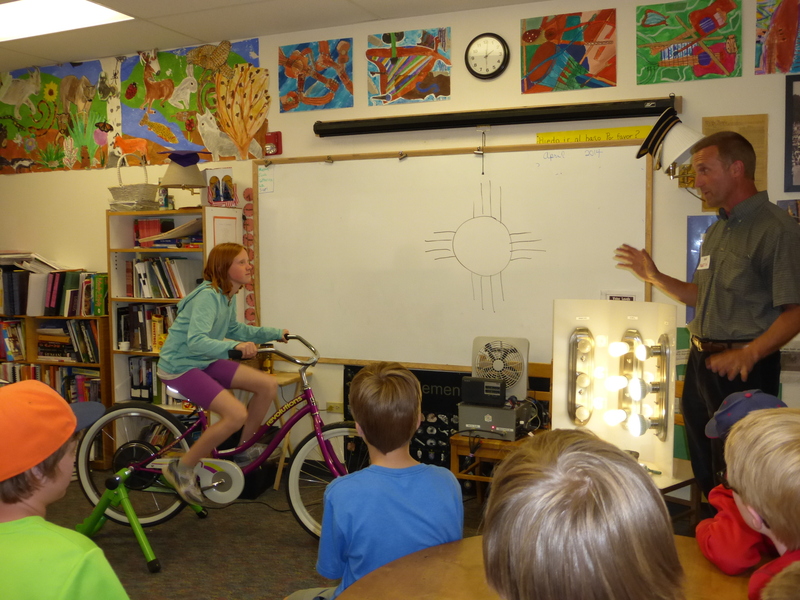 It featured the “Energy Bike” that students pedal to convert their mechanical energy to electricity that runs a variety of lightbulbs and small appliances. Energy transformation, energy efficiency, energy conservation and more . . . all within the context of understanding our living planet! 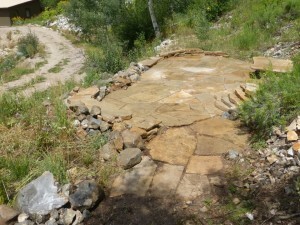 Land stewardship and related work for Aspen Center for Environmental Studies (Building of patio area for preparation of medicinal plants; non-native plant removal) – June and July, 2013. The “Energerium” – A suite of nature center displays (covering one floor) interpreting human energy systems as part of the living systems of Earth. This was one of Martin Ogle’s last projects before he retired from his position as Chief Naturalist of the No. Virginia Regional Park Authority. Developed all of the themes and content for this display suite and worked with the company “DesignMinds” to bring it to fruition. This display suite accompanied many other energy related features at Potomac Overlook Regional Park (Arlington, VA) including working solar hot water and electricity systems, large-scale energy efficiency renovations and an active energy education program. “A Dream of Gaia” – A dramatic performance at the Artisphere in Arlington, VA, July 2011. Presentation included storytelling, music, and narrative of the metaphor and science of Gaia. 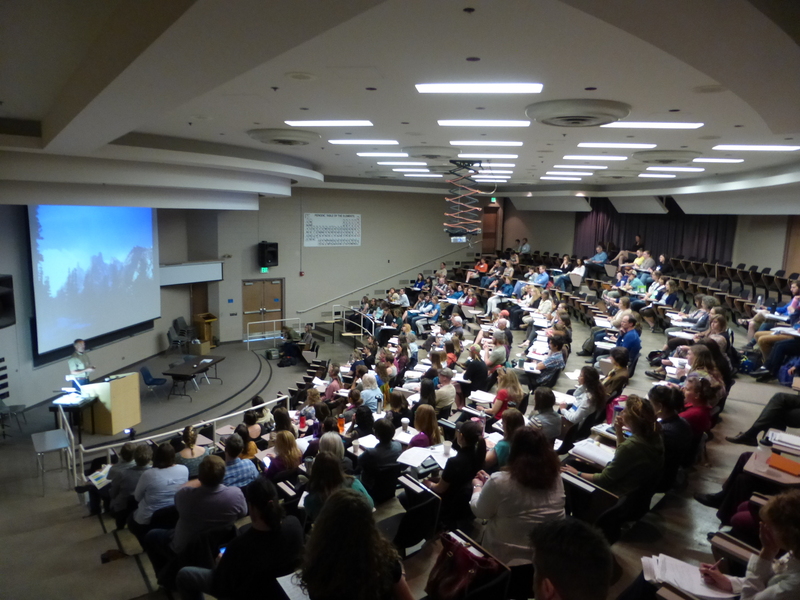 Over 200 people in attendance. 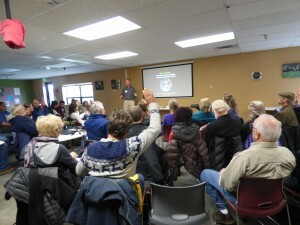 Gaia Theory Presentation at Denver Museum of Nature and Science, January, 2013 – an overview of Gaia Theory for a group of staff and volunteers at the museum and some invited members of the public. 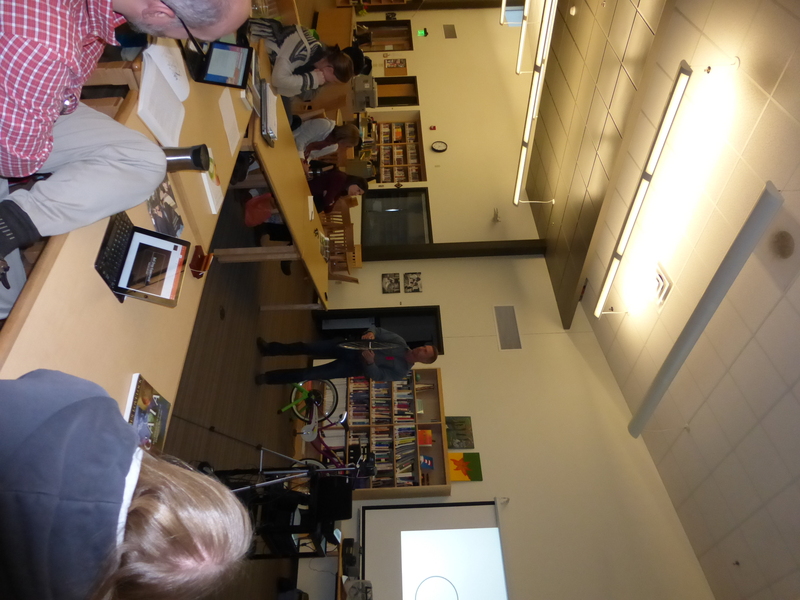 Energy, Gaia Theory, schoolyard education, fossils/geology, and “general science” presentations at local schools, September 2012, April, 2013 – Louisville Elementary School, Summit Middle School and Watershed School, Boulder. 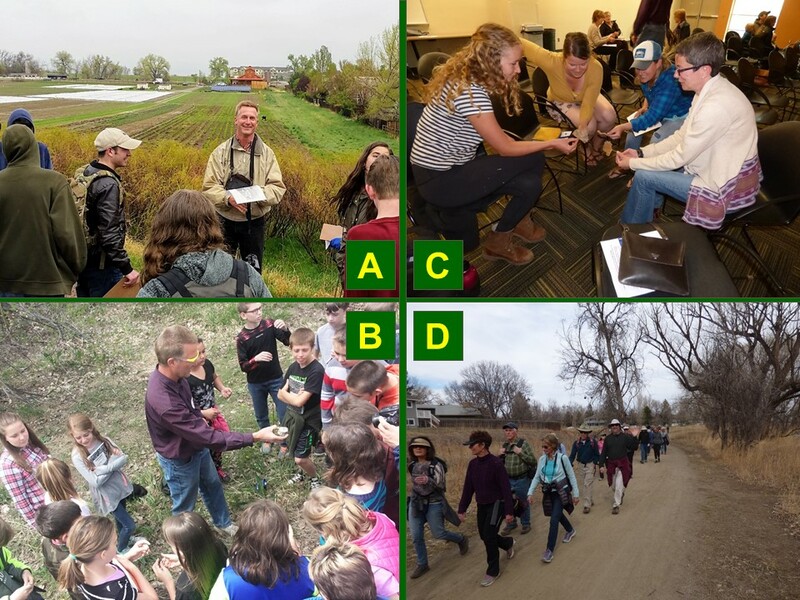 Children and Nature presentation for the Colorado Parks and Recreation Association, May 2013 – This presentation was about not just getting kids outside, but the kinds of activities and techniques that encourage kids to slow down and experience the pace of nature. Storytelling, solo spots, unstructured play and other such things were discussed and demonstrated! 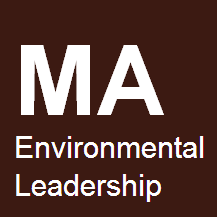 Adjunct Professor of Sustainability – Mr. Ogle has just been hired to teach “ENV 710: Sustainability: Policy and Practice” at Naropa University, Fall semester, 2013. 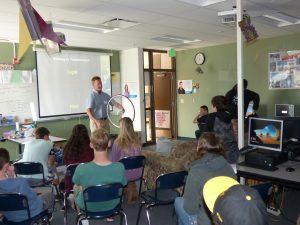 Clean Energy Action – working with this non-profit group to advance youth energy education in Boulder County, January, 2013 – present. Two presentations on the similarities and synergies between Aldo Leopold’s “land ethic” and the “Gaia paradigm.” Presented for . . .